Fourth Row Center: Film Writings by Jason Bailey: New on Blu: "Cannes Man"
New on Blu: "Cannes Man"
The cast list of Richard Martini's Cannes Man is intriguing--the front cover lists such draws as Johnny Depp, Benicio Del Toro, John Malkovich, and Dennis Hopper. Ha ha, joke's on you. Fourth-billed Depp has the most screen time of the bunch (about five minutes, I'd guess); the others have a minute or two each. The film, a would-be The Player for the indie set, was mostly shot on the fly at the 1995 Cannes Film Festival; most of the scenes with actors you've heard of appear to have been organized and improvised on the spot. Harvey Weinstein is photographed through a long lens, telling an unrelated story to star Seymour Cassel, as voice-over narration puts words into the then-Miramax head's mouth. Surely I'm not the only person who will watch this scene and think of Bowfinger. If I had to guess--which I have to, since Cinema Libre's new Blu-ray of Cannes Man includes zilcho bonus features to explain the film--I would surmise that the presence of an icon like Cassel was what got actors like Depp, Malkovich, and the rest to agree to appear in the film; a member in good standing of the Cassavetes company, Cassel is a living legend, especially in indie circles. However they pulled it off, the fact that they got some names into this (apparently) no-budget throwaway is impressive. It doesn't do much to help the movie, however. The story begins at the funeral of Cassel's character, a famed flim-flam man/low-budget producer named Sy Lerner. Sitting at the funeral, Frank Rhinoslavsky (Francesco Quinn) recalls how they first met: at the Cannes Film Festival, where dopey, movie-loving cabbie Frank was working as a courier for Troma. Lerner and a producer buddy, discussing whether the festival is all hype, make a bet: Lerner says he can turn any schmuck into the toast of Cannes. Frank is selected; when he sits at their table, he immediately leans back in his chair and falls over. Har de har har! Could Cannes Man have worked? Perhaps. The trouble isn't the concept, it's the execution. 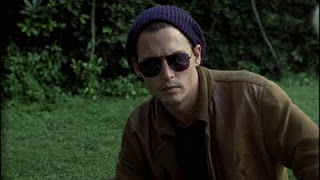 The satire is tepid and flaccid, in spite of a couple of funny scenes; Frank Whaley just about steals the picture with his dead-on parody of actorly hyperbole, while Johnny Depp and Jim Jarmusch's scene, in which Sy and Frank interrupt their meditation for a pitch ("We're floating," Depp intones. "Jim and I are above you"), is amusing--particularly when their high-minded spirituality is derailed by catty arguments over "points." But little else lands comically, primarily because so much of the humor rests on the unsteady shoulders of Quinn, whose performance amounts to a collection of Italian caricature tics. He's like a guy doing a bad Joey Tribiani impression. When Frank and Sy fight and separate in the third act, leaving Quinn to carry the picture alone for fifteen minutes or so, it goes particularly deep into the toilet. As a curio, Cannes Man is occasionally diverting; it is, for example, fun to see young Bryan Singer and his actors Benicio del Toro and Kevin Pollak at the '95 festival with that Usual Suspects movie of theirs. But aside from the occasional opportunities to gawk at celebs, Cannes Man is a flat, one-note, unfunny picture. That famous faces were roped in indicates ingenuity on the part of the filmmakers, similar to those one and two-reelers that Mack Sennett would throw together around a parade or local event. But while taking advantage of a situation may make a film clever, it doesn't make it good. "Cannes Man" is available now on DVD and Blu-ray. For full A/V and bonus feature details, read this review on DVD Talk. On DVD: "How I Won The War"
New on Blu: "Big Jake"
On DVD: "A Musicares Tribute to Neil Young"